One of the main characters in Star Wars: The Force Awakens is, lo and behold, a child soldier. Raised from birth to "do one thing," that thing being "follow orders," the character who we come to know as Finn has been brainwashed and trained since he was young - taken from his family and conditioned into being a loyal First Order Stormtrooper. 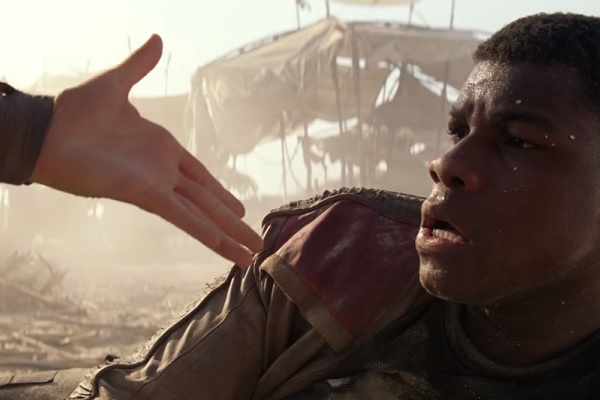 And then, without any explanation, upon embarking on his first ever mission to the planet Jakku, Finn decides that he doesn't want to be a Stormtrooper. There's no reason stated for his change of heart, nor does he appear to have the inherent mannerisms of somebody who has been brainwashed since childhood. What makes Finn so able to defect, then, when all the other Stormtroopers are so willing and primed to conform? Also: why is Finn so bumbling and inept when he has had years and years of training? He's easily taken down by Rey the first time they cross paths, and spends much of the movie either falling over, failing to do stuff, and - at time - lacks basic knowledge. Occasionally, he's good at fighting if the script calls for it (like in the lightsaber fight), but it's jarring. Generally speaking, then, Finn doesn't feel at all like a person who has spent their life being told what to do; he has far too much personality. And is too clumsy.